Tristan Griffin is a famous crime writer living in a Belizean jungle lodge with his partner Hedda. Altamont Stanbury is a constable in the nearest village, and an avid reader of crime fiction. Their lives come together with unexpected consequences when Griffin attempts suicide and Hedda goes missing. RK Salters was born in Paris to an Irish émigré father and French mother. He is himself an exile, currently living in Lithuania, and a passionate traveller. An expedition in Belizean jungles provided the setting for Butterfly Ranch, his first novel. A story of love, pain, loss and tragedy, this novel is both dramatic and almost operatic in its setting and plot line. In fact, it would make a fine opera, requiring only a sparse libretto with lots of bass and drums, thunder and lightning. A taut psychological drama with clearly delineated characters. The plot is ambitious but very deftly handled, with backstories adding to rather than holding back the delivery of the main narrative thread. 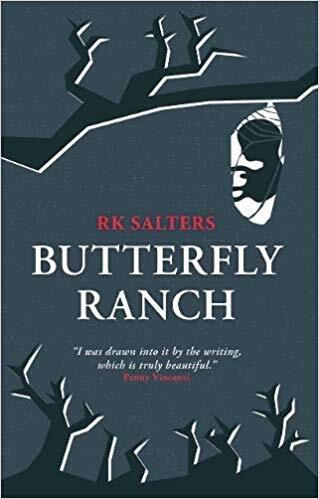 What stuck with me most was the unsettling atmosphere up at the ranch, with each character struggling to live up to the circumstances of their lives, and then a genuinely satisfying pay off at the end. Superbly written. Remy Salters is a stylist of the highest order, and that is rare in these days of clunky writing. A stunning tour de force. Unrequited love, nature’s beauty and ultimate redemption all blend in this book which I devoured in one sitting, as the suspence kept me going into the small hours. RK Salters is one to watch. Marvellous book, changerd my behavour and feelings. A book full of compelling characters and desperate emotions, delicately woven into a gripping plot. Remy Salters’ language glitters beautifully above all of that. A rare gem that will leave you longing for the author‘s next work. A beautifully written book. Exquisite prose that never gets in the way of an engaging story. What a fantastic book! A suspenseful plot, beautiful language and a wonderfully conjured vision of the Central American jungle. Do try it. An absorbing and gripping read with the added benefit of being eloquently written. I was totally engrossed and transported to Belize. A stunning first novel, I look forward to the next! This was originally described to me as a mystery novel but it has so much more to offer than a classic mystery. The characters are extremely rich and the layers of psychological tension and trauma that get unpeeled as we dig deeper into the narrative are truly moving to the core. This is a book that stays with you long after you finish reading it. Beautifully written psychological thriller. Dramatic atmosphere in the exotic setting of Belize. A must read page turner. A fantastic read. The characters are skillfully developed and the story beautifully told. Totally absorbing narrative with sensitive writing, tense development, vivid characters and a setting which mesmerizes.